What makes GREAT Tribal music? Finding great new music is a passion of mine. I love making playlists for my students and classes, and even craft a new one inspired by each of my monthly workshop topics. I spend what some might consider a surprising amount of hours carefully selecting each song and, even beyond that, hunting down great new tunes to bring into each rotation each year. Why? Well for Tribal style bellydance not all songs are created equal. And, depending upon what you’re intending to accomplish in your dance, some music is far more suited to your dance than others. Then Misha, you might ask, what makes a great Tribal bellydance song? I personally like to look for a few things right from the beginning. When I listen to the whole piece, is the main quality of the song fast or slow or medium? In Tribal, and really in bellydance in general, we have different moves that are suitable for each. So I tend to select songs first based on their tempo. This helps me know intuitively which moves I will most likely be able to select from our GC vocabulary. From there, I look at the overall quality of the piece. When I dance Raqs Sharqi, Turkish style bellydance, or American cabaret, I love to have music that has a dynamic orchestra and “lots going on.” I’m a big fan of rhythm changes, and I adore a good chunky lyrical phrasing on top of a sassy drum beat. But for Tribal? My music predilections change quite a bit. When I dance Tribal I generally begin first to look for a more steady beat. A rhythm that doesn’t change or, if it does waver, one that is steady and easy to follow through those changes. One that’s clear and that both leaders and followers will be able to track as it moves them through the piece. While I love to hear lyrical changes, these aren’t as important to me as a dancer as they would be for a more Oriental style piece. Instead, I’m searching for music that I know will provide a firm foundation for Tribal improv. I love to use songs that have an earthy feel – lots of drums and in particular I adore hearing reedy instruments like mismars and neys added to the mix. 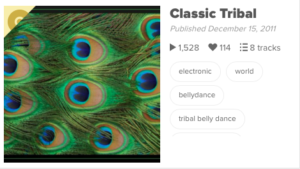 While I will use modern or contemporary pop from time to time, especially songs that are a lot of fun and peppy, I generally stick with more folkloric sounded music in order to honor the “Tribal” look and feel of our costuming and movements. I tend to avoid music that has lyrics, especially those in foreign languages, unless I’m certain I know what the singer is saying. It’s incredibly important to be aware of the lyrics because what you might think is a beautiful love song could actually be a religious piece and something that is not appropriate to use in a dance performance or practice. Whatever you choose, be sure to enjoy it! Half the battle of finding “great” Tribal music is simply finding music you enjoy dancing to, so be sure to listen and make certain that you love it!